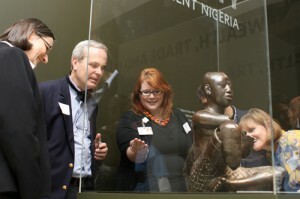 Before the opening in August of the exhibit of ancient Nigerian art she curated for the Indianapolis Museum of Art, Wabash Art Professor Elizabeth Morton hoped aloud that Dynasty and Divinity: Ife Art in Ancient Nigeria would shatter museum-goers’ preconceived notions of African art. Thursday night she gave members of the Wabash community a guided tour through those “treasures of the spirit” and may have simultaneously shattered preconceived notions of what a Wabash College alumni event can be. See photo albums from the event here and here. 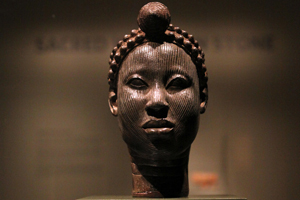 Dynasty and Divinity: Ife Art in Ancient Nigeria is the largest and most inclusive display from the ancient spiritual home of Africa’s Yoruba people ever to tour the West. Well over 100 alumni and faculty and their families, staff members, students, and parents of current students attended the reception for Morton and the exhibit, an event sponsored by the Indianapolis Association of Wabash Men and organized by Morton and IAWM Board Member Brad Johnson ’71. Johnson thanked the many Wabash professors and their family members for coming from Crawfordsville for the event, and President White asked for a show of hands from parents of current students. 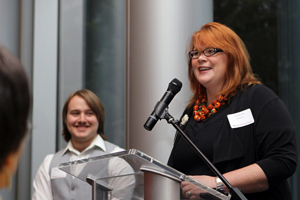 Professor Morton spoke of the students who worked with her preparing the exhibit, recommending the “ipod” audio-video tour viewers can carry with them and which features the voices of Michael Brown ’13, Luke Robbins ’11, Adam Phipps ’11, and Wabash Theatre Professor Jim Cherry. She noted that recent graduates Ian Starnes ’11, Eric Brown ’11, and Drew Palmer ’11 had also worked on the project. Then she led the gathering to the gallery.